Enzo Life Sciences expands its immunoassay portofolio with the introduction of TIMP-1 (human) ELISA kit. Tissue inhibitor of metalloproteinases-1, TIMP-1, is one of the four members of the TIMP family which inhibit the activity of the matrix metalloproteinases (MMPs), a large group of peptidases involved in degradation of the extracellular matrix. TIMP-1 displays multiple biological functions. TIMP-1 is capable of inhibiting the activities of most MMPs except membrane-type MMP subfamily. Associated with its inhibitory activity on MMPs, TIMP-1 is able to promote cell proliferation and survival in a wide range of cell types. The balance of TIMPs/MMPs plays a crucial role in extracellular matrix homeostasis and remodeling, the imbalance of TIMPs/MMPs is involved in various kinds of diseases in multiple organs. Breaking the balance between MMPs and TIMPs occurs in various pathologic processes and involves all the members of these two families. Elevation of TIMP-1 has been reported in diseases such as systemic sclerosis, amyotrophic lateral sclerosis (ALS), renal disease and cancer. Down regulation of TIMP-1 was found to be associated with ischemic heart failure and chronic inflammation. Enzo’s TIMP-1 ELISA kit provides a useful tool in investigating the TIMP-1 levels in multiple human matrices and will help advance the studies on TIMP-1 function. The highly sensitive TIMP-1 ELISA kit format allows for quantitative detection of 30 pg/ml of TIMP-1 in various sample types including: serum, plasma, saliva, urine, and tissue culture media. The assay offers high throughput analysis, measuring up to 39 samples in duplicate in just 2 hours. The ELISA is thoroughly validated to ensure excellent reproducibility between experiments, and low or no cross-reactivity with related molecules such as TIMP-2, TIMP-3, TIMP-4, MMP1, MMP-2 MMP3, MMP7, MMP8, MMP9, MMP13. Like all Enzo Life Sciences ELISA kits, the TIMP-1 ELISA kit is complete, flexible, and put through rigorous validation and stability testing to ensure high precision, accuracy, sensitivity, and specificity. It is supplied with an easy-to-follow protocol, pre-coated microtiter plate and liquid color-coded reagents to save the user time and reduce errors. The 96-well break-apart strip plate design provides maximum flexibility, minimizing cost and waste. The TIMP-1 ELISA kit is the most recent addition to the Enzo ELISA portfolio. 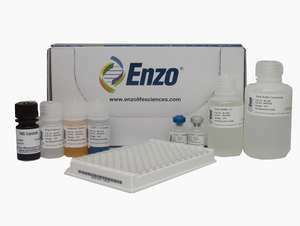 For more information or to order the TIMP-1 ELISA Kit or other Enzo Life Sciences products, please visit us at www.enzolifesciences.com or call us at 1-800-942-0430.